Growon Medical Technology brings forth innovative SSETUR analog electro surgical unit that is integrated with microprocessor based controls. Its monopolar (cut & coag) and bipolar modes exhibit superb performance that makes it ideal for several types of surgery that require high precision and reliability. 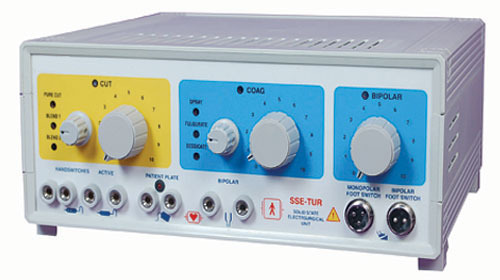 Further, the surgical generator also provides the user complete safety and performance while carrying out a surgery. This model of electro surgical unit has pure cut that is exceptionally smooth and starts promptly even in irrigated procedures. Unlike other spark gap generators, these units give a good hemostasis effect than cutting and spray coagulation with minimum cutting effect. Growon Medical Technology brings forth innovative SEE-TUR electro surgical unit that is integrated with microprocessor based controls. Its monopolar (cut & coag) and bipolar modes exhibit superb performance that makes it ideal for several types of surgery that require high precision and reliability. 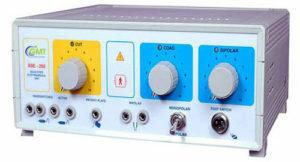 Further, the surgical generator also provides the user complete safety and performance while carrying out a surgery. This model of electro surgical unit has pure cut that is exceptionally smooth and starts promptly even in irrigated procedures. Unlike other spark gap generators, these units give a good hemostasis effect than cutting and spray coagulation with minimum cutting effect.